betaworks Studios designed by Leong Leong opened its first location in New York’s Meatpacking neighborhood in Spring 2018. The Studios concept is part social hub, part technology incubator, and part membership based co-working space. The design translates observations about entrepreneur culture, hospitality, and contemporary work-space into a new hybrid. “As architects, we increasingly see the value of space relative to the gig-economy and network culture to bring people together in real life. This desire for connection is apparent in so many areas of contemporary life from cultural institutions to hospitality to the workplace. Increasingly, we are exploring how to intermesh physical and virtual communities to produce more meaningful social dynamics and knowledge exchange. Betaworks Studios is an ambitious concept that creates a tech-oriented social space for the exchange of ideas and the building of new technology products.” says partner Dominic Leong. The design of Studios encourages members to meet and connect with one another in a collaborative and dynamic environment. From networking events and dinners to one-on-one meetings and serendipitous encounters, a range of activities take place each day, supported by the project’s open layout. Upon entering the 12,000 sf space in a historic landmark building, a concierge provides information on the events of the day and facilitates connections among members. The main area is organized much like the lobby of a hotel with a large, open plan and a range of formal and informal seating. 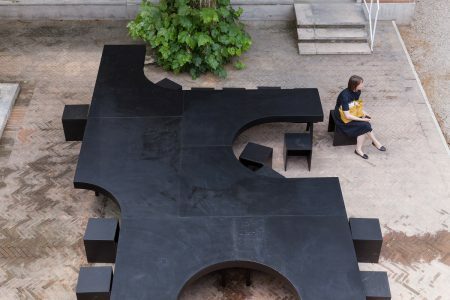 In the center of the space is the ‘Forum,’ where flexible semi-circular benches can be arranged in a ring or other formats to encourage interaction like a “think session.” Along the sides of the main area are ‘Beta Booths,’ curvilinear banquette seating tucked within acoustically dampened vaults designed for more intimate modes of work and conversation. 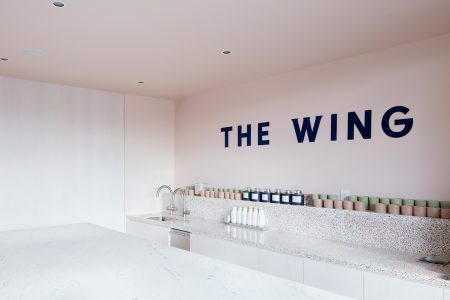 Another key element in the space is the ‘S-Bar,’ a gathering point that facilitates knowledge exchange, the chance to meet other members, and a counter to order food or coffee. The ‘Anchor Space’ is a large enclosed room with bi-folding glass doors that can be expanded to accommodate larger events, or enclosed private meetings. A luminous red 10 ft by 28 ft photograph by artist Mark Borthwick lines the back wall of the room. Other amenities include private meeting rooms, an open whiteboard room for ideation and brainstorming, and individual booths for private calls and podcast recordings. “This is not a typical co-working space. This space has the social dynamics of an urban hotel lobby which blends networking events, informal talks, and intimate discussions. The only thing that is not encouraged is working in isolation,” says partner Chris Leong.